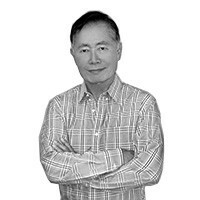 George Takei: I Lost Family in Hiroshima. Mr. Trump, Nuclear Weapons Are No Game. The ‘Star Trek’ actor, activist, and LGBT icon writes about the president-elect’s cavalier—and deeply troubling—attitude towards nuclear weapons. Three days before Christmas, President-elect Trump tweeted (yes, tweeted) that the U.S. “must greatly strengthen and enhance its nuclear capability” until the world “comes to its senses regarding nukes.” The world, for its part, blinked in astonishment, wondering once again what Mr. Trump might mean, and why such a momentous announcement appeared via social media. Prior presidents generally undertook any shift in nuclear policy with care, and with the advice of experts in arms control and proliferation who have made keeping us safe their life’s mission. After all, when a single person has the power to rain down nuclear fire across the world, caution might not only be warranted, but expected. Trump’s language seemed to imply a new arms race. So if the tweet, like many of his brazen acts, was meant to shock and unbalance others, it worked. Surely Trump couldn’t be calling for a renewed emphasis on these weapons, not after so many decades of effort to de-escalate and disarm, and surely not via Twitter? But Trump soon doubled down on his nuclear gambit in a follow-up interview: “Let it be an arms race,” he told MSNBC’s Mika Brzezinski. And with that, the future became quite unclear—and many times more dangerous. I can’t help but feel Mr. Trump treats brinksmanship as some game. It’s hard to believe he needs reminding, but nuclear weapons are not toys, nor are they chips to be wagered in some kind of high stakes poker match. I am among a dwindling number still around who remember the first time atomic weapons were used—at that time to end a terrible world war. I had family in Hiroshima when the Enola Gay dropped its deadly payload, obliterating the entire city in an instant. My aunt on my mother’s side was among the over one hundred thousand dead, along with my baby cousin, who was found cradled in her arms in one of the canals that fan out through the city, their bodies burned nearly beyond recognition as she attempted to shield her child from the blast and the fire. It has been many decades since the specter of nuclear weapons, an arms race, or proliferation held center stage in America. To those who remember, those were uneasy times. The doctrine of “Mutually Assured Destruction” was aptly abbreviated “M.A.D.” for only madness, it seemed, could commence a true apocalypse. The Soviet Union and the United States pointed their weapons like guns to each other’s heads, knowing that pulling the trigger meant both sides perished in flames and radiation. But what both sides had then, which seems terrifyingly lacking now, was at least a genuine sense of the seriousness of the circumstances. Nuclear armament—and disarmament—was by agreement a delicate dance. When the missiles are locked and loaded, you don’t act abruptly. The slightest miscommunication or misstep could spell doom. So it is with ever-increasing alarm that we must acknowledge that a man, who apparently lacks the self-control to keep his fingers from tweeting, now literally has those same fingers on the nuclear button. But beyond the question of temperament, I must ask: Does Donald Trump understand the true horror of what he can unleash in an instant? In the city of Hiroshima, there is a group of survivors called the hibakusha. They have dedicated their lives to ensuring no one on this earth again suffers the fate of their city. During his recent visit to Japan, President Obama stopped in Hiroshima as a historic first, a sitting president acknowledging the great suffering of its inhabitants. He spoke of a nuclear-free world, where nations that hold weapons remain the only members of that deadly club, and where each works to ratchet down its arsenals and bring about disarmament through mutual steps and aligned goals. The sudden reversal by Mr. Trump not only walks us back from this vision; it replaces it with a threat of further escalation and instability. Paired with his equally cavalier talk about proliferation—suggesting that nations such as Saudi Arabia and Japan should acquire nuclear weapons—we are perilously close to uncorking the genie from the bottle for good. Albert Einstein, who once urged President Roosevelt to develop the atom bomb, noted after its deployment twice in Japan that we stood on the brink of self-annihilation. The only true thing that has long stood in the way of such a war was a sanity check among experienced, reasonable leaders that frighteningly may no longer hold. I hope, indeed pray, that when Trump speaks of the world “coming to its senses about nukes,” he includes the United States and his own self as President. If his pre-inaugural actions are any indication, it is Trump, above anyone, who must come to his senses about what these weapons represent. Trump might do well to pay his own visit to Hiroshima, where the hibakusha keep alive the terrible legacy of atomic warfare, precisely so that we might not blunder down a ruinous path. It is not enough that our president-elect think twice before he tweets about nuclear weapons, though that might be a good start. He must come to understand, viscerally, what is at stake in their possible use. For the sake of all humanity, he must come to see nuclear bombs not as fearsome weapons to be revered, but as the literal dead end they are.